My March issue of The Sun magazine included a fascinating article by Michael Pollan entitled “Why Cook.” I have mentioned the publication in the past and urge everyone to take a moment to investigate this literary gem. Pollan’s piece explores what he terms the “cooking paradox” and why it is a defining human activity which sets us apart from all other creatures. I have begun to take more interest in cooking due to my association with the store. Every customer asks for recipes or how I would pair certain ingredients. I now think about cooking more as a creative outlet, less as a necessary activity. Cooking for oneself or even just two, is less intriguing then planning a dinner party or feeding a family. It is easy to slip into the convenience of prepared foods. The tricks I am discovering is in taking that convenience and making it healthy and enticing. With that in mind, I offer a simple, inexpensive, single-serving, meal that the unsuspecting diner will assume you spent hours preparing. One bag of frozen Butternut Squash Ravioli. Boil, adding a bit of EVOO (Extra Virgin Olive Oil) to the water, until they float. Drain. In the same pan, heat while shaking over a medium flame, Butternut Squash Seed Oil with fresh sage leaves (four small or two large). Add a handful of pine nuts and continue shaking and turning until the pine nuts just start to brown. Add the ravioli and shake a few times then allow to sit. Salad is baby greens, half a grapefruit, a handful of dried cranberries or fresh pomegranate seeds, a sprinkle of hazelnut seeds and chopped peppers. The dressing is black cherry balsamic mixed 50/50 with lemon OO. This entry was posted in Cooking, Uncategorized. 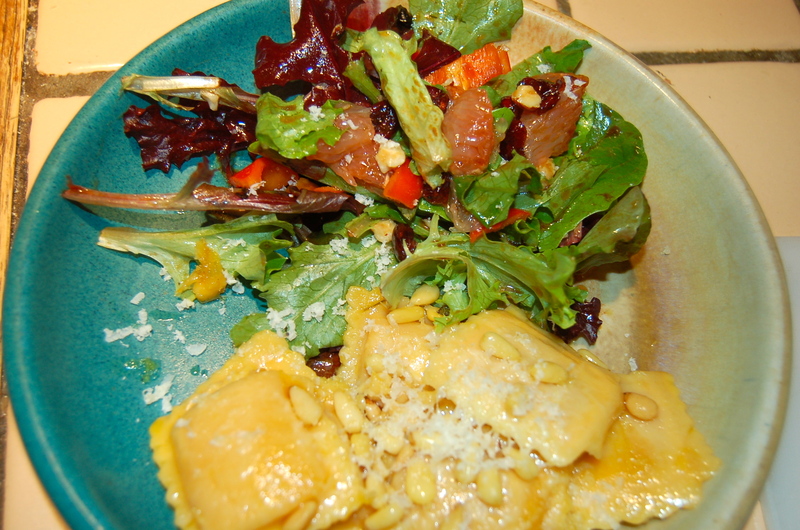 Tagged Balsamic, Butternut Squash Ravioli, Butternut Squash Seed Oil, cooking, Extra Virgin Olive Oil, Michael Pollan, New Hampshire, salad, The Sun Magazine. Ill be there by dinner time …….!!! Sounds wonderful, again. Wish you would be here for dinner! Chef Lou’s Veal Stew is up on the MOV site! I think I’d rather come to your house for that!! I cook quite a lot and am still surprised how hard it is to make only enough for one, so I eat a lot of leftovers. That is my problem as well, add to that, I hate leftovers!